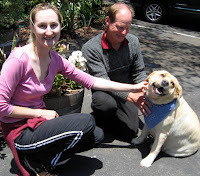 At 9 a.m. on June 18, Mama and I arrived at the Windsong Resort for Pets off Deer Springs Road in Escondido. The spa in owned by AKC-licensed judge Michael Dougherty and his wife, Michelle, who is an accomplished sculptor and horticulturist. 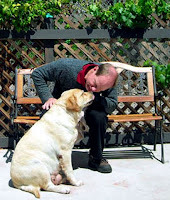 I met the Dougherty's last year when I first wrote an article about Michelle's exhibit at the Flower & Garden Show at the 2008 San Diego County Fair, and later about their Windsong Resort for Pets. I was delighted to run into them again at this year's fair as Michelle was putting the finishing touches on her exhibit at the Flower & Garden Show. When a friend who was with me urged me to tell them about Mama, Michelle responded, "If there is anything we can do, please let us know." Michael quickly followed, "Yes, we want to help." We took them up on their offer. Last Thursday Mama spent 3 hours being pampered at the posh resort. 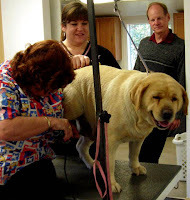 Groomer Michelle Millington and department head Susan Sholar spoiled the young English lab with a pedicure, furminator treatment (removal of dead hair in the undercoat to reduce shedding), tail and pants trim and "hygienic detailing." This included an ear cleaning and other treatments too personal to mention. Afterwards Mama was lathered up for a milk bath shampoo and oatmeal conditioner. Michael has judged show dog competitions throughout the world including for the prestigious Westminster Kennel Club. 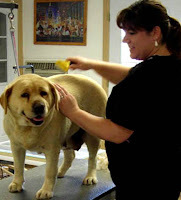 He was distressed to think that an owner would breed Mama repeatedly, while not taking proper care of her, and allowing her to get dangerously obese. "Anyone who loves dogs, and appreciates their value in one's life, wouldn't do this," he said. "This is an opportunity for Mama to regain her true self. She's had a tough life, but she's on the right track to a great one!" He added that Mama was a little guarded at first, then gave in to her "Inner Diva." "When we put her on the grooming table, her claws were tense like she was grabbing to hold," he said. "After a few minutes, the feet absolutely relaxed. Her nails no longer were digging for traction." Susan was complimented when Mama showed affection while being coiffed and groomed. 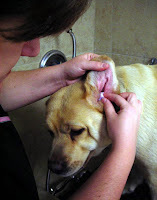 "When I was filing her nails, she put her paw on my shoulder," she said. Michael took note of Mama's beauty, inside and out. "She's got a great temperament," he said. "Her head is slightly wedge-shaped, but it should elongate out a bit visually as she drops the weight. Her overall station, structure and balance are very correct." 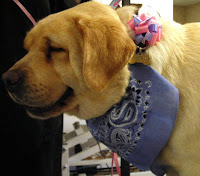 For more information about the Windsong Resort for Pets call (760) 233-5060 or visit www.windsongpets.com. That is probably the most pampered (if at all) this little "Mama" has ever been. She looks like she has responded so well. Everyone responds to love. I pray there will come a day when all BYB and Puppy Mills are illegal. God Bless you for what you are doing. Lillian, forget about finding a home for her, I think she has already found one.